My daughter noticed my recent purchase of shamrock washi tape in my craft closet the other day and she couldn’t contain her excitement. When she asked if we could make a craft with it how could I say no?! Since she loved our Laced Heart craft so much last month, and with St. Patrick’s Day being around the corner, we decided to make a Washi Tape Laced Shamrock. 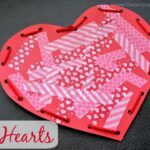 We made this the same way as our Washi Tape Laced Heart, but with a Shamrock shape instead. 1. 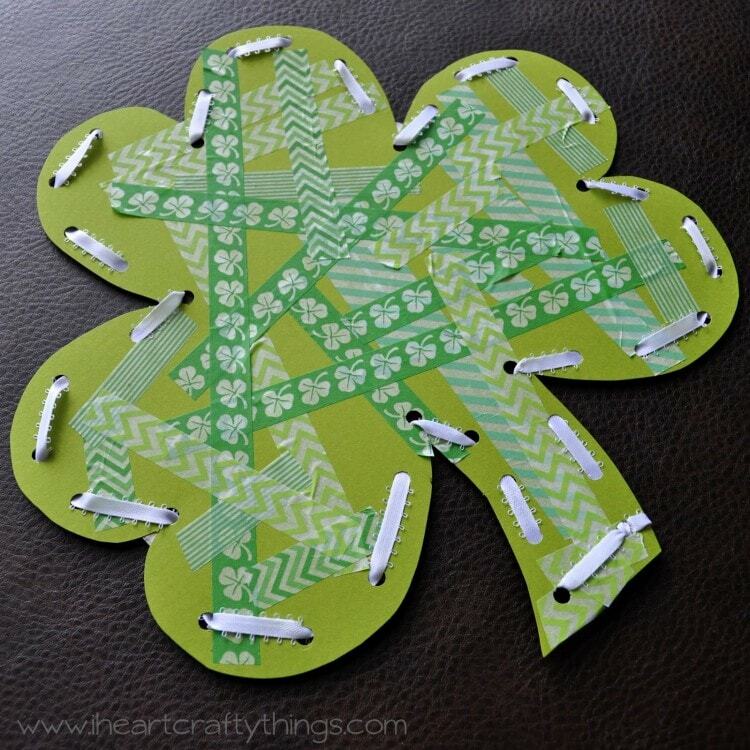 Cut a shamrock shape out of your green cardstock paper. I used a pencil to draw my shape on the paper first and then cut it out. 2. 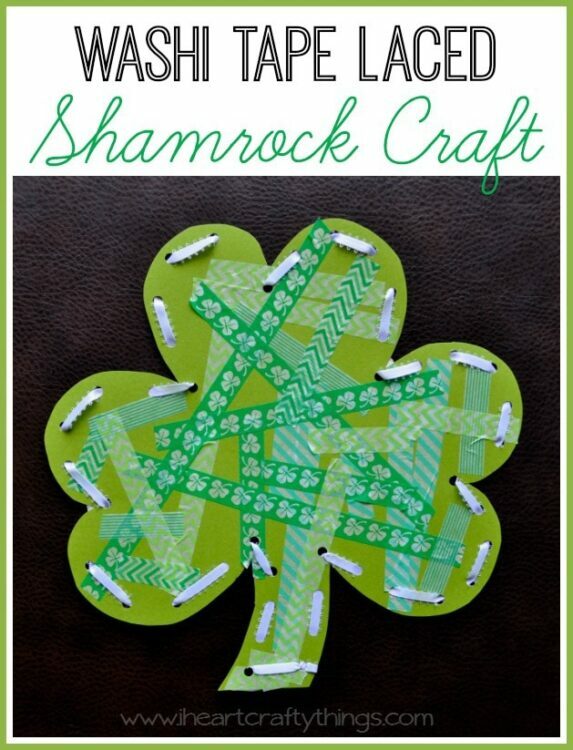 Cut different sizes of washi tape and place them all over your shamrock. How much your child can do on their own of this step depends on the age and skill development of your child. 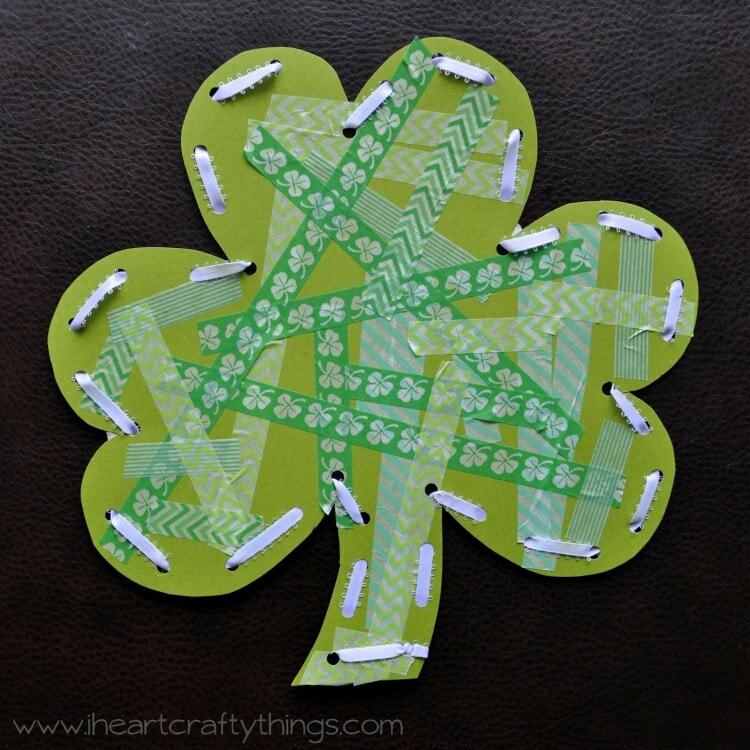 If you have a toddler and they don’t use scissors yet, you can cut the pieces of tape for them and let them place the tape on the shamrock. We have done this activity several times now so my daughter was able to roll out the tape and cut it all on her own. 3. 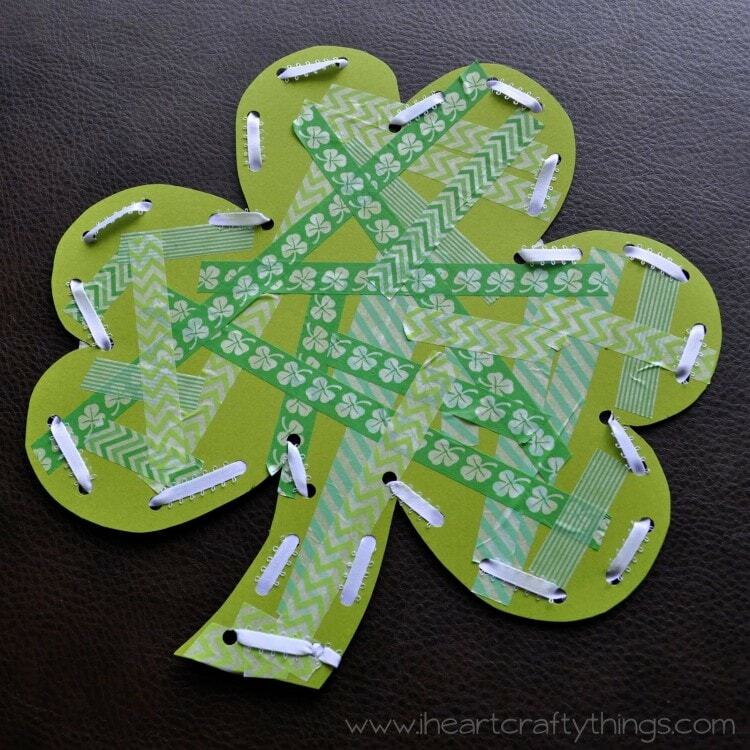 After your child is finished decorating their shamrock with tape, use your hole punch to punch holes all the way around the shamrock for lacing. 4. Cut a piece of ribbon or yarn for lacing. I used my ribbon to roughly measure around my shamrock for how much I would need. Put the ribbon through one of the holes in the shamrock and tie a knot to start the lacing for your child. I wrapped the opposite end of the ribbon with masking tape to make it easier for my daughter to lace in and out of the holes with the ribbon. Now just have your child lace through all the holes of the shamrock. 5. When my daughter got to the end of the shamrock, I helped her tie a knot and cut off the excess ribbon. 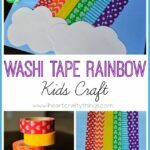 My favorite part of doing these washi tape crafts with my daughter is how much fine motor practice she gets out of them. It is amazing to see the difference from our first experience with our washi tape pumpkins to now how she can complete the entire project on her own. 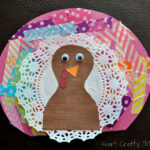 Such simple projects every holiday that really help develop important skills. « Rainbow Swag Bunting…Made from Cupcake Liners!